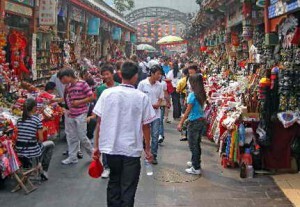 In recent years, more and more attention has been focused on the widespread and increasing income inequality in China. Many scholars have noted that globalization could help to explain the rising inequality in China. It may be true that globalization, unevenly concentrated in coastal urban areas, leads to uneven development at both intra-regional and inter-regional levels, and the uneven development in turn leads to more regional inequality than without the effect of globalization. However, these scholars ignore that globalization also leads to human capital reallocation through both inland-to-coast migration and rural-tourban migration, which act as a force of convergence in neoclassical theories. This study is concerned with the potential inequality reducing role of migration. In particular, when China is becoming more and more globalized, areas (especially urban areas) closer to the outside world would have more opportunities to attract in-migrants from other areas of the country or the region. And the migration flows would potentially reduce the increasing inequality, which has been partly caused by globalization as the existing literature notes. In other words, I attempt to decompose the effect of globalization on inequality into two parts: the divergence effect and the convergence effect through a potential intermediating variable – migration, in which the second part is the focus of this study. The data I use for this study come from two major sources. Specifically, migration data come from 11 volumes (1992-2003) of the China National Population Statistics by County edited by the China Public Security Bureau; data for globalization, inequality and other control variables come from the Comprehensive Statistical Data and Materialism 50 Years of New China edited by the China State Statistics Bureau (SSB) (1999). This study adopts Fixed-Effects (FE) model to estimate the effect of globalization on internal migration and the effect of internal migration on regional inequality. In particular, a set of province dummy variables are included in the regression model as a oneway ANOVA test. Superior to OLS model, FE model takes into account the individual characteristics of each province, or the unit-specific effect. Also, I use the Geographic Information System (GIS) in this study. I take advantage of GIS to describe patterns in globalization, migration and inequality across provinces, and visualize the relationship between geographic areas and their socioeconomic attributes (e.g. globalization level, intra-provincial migration, inter-provincial migration, intra-provincial inequality, interprovincial inequality). 1) Globalization is a significant and positive predictor of migration at both intra-regional migration and inter-regional levels. After using a province’s geographic proximity to two biggest trading seaports in China (Hong Kong and Shanghai) as an instrument in the model to solve the potential endogenity between trade globalization and labor migration, the results remain the same. 2) Migration is a significant and negative predictor of inequality at both intra-regional and interregional levels, which is consistent with my early predictions.